The first tutorial shows how to clone the Daggerfall Unity source code from GitHub, followed by a quick escape from Privateer’s Hold to check everything is working normally. If you cloned the full project from GitHub, you can skip most of the initial scene and project setup and just open Assets/Scenes/BasicScene.unity to begin. This is the quickest way to get up and running before stepping through tutorials. 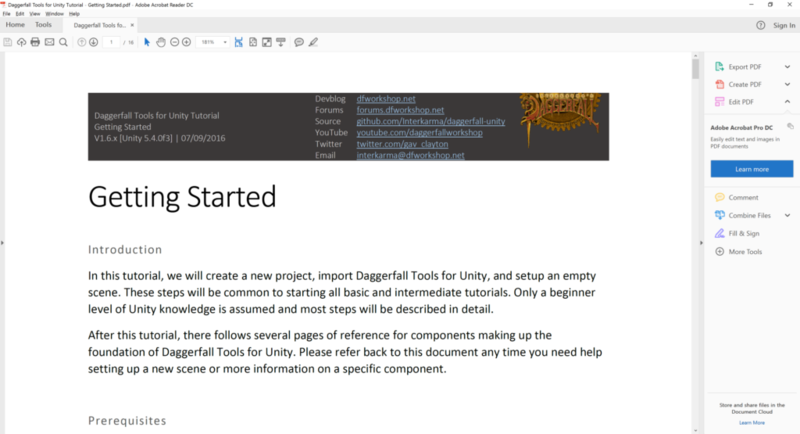 If you’d like to setup your project and scene manually, and gain a deeper understanding of Daggerfall Tools for Unity, it’s recommended to step through this tutorial first and get everything ready manually. You can download a pre-built asset package from the Daggerfall Tools for Unity project page. Note: The following tutorials are for an older version of DFTFU. They might not work as expected in current releases.